In August 2016 the latest census was conducted by the Australian Bureau of Statistics and HistoryParkes thought it would be interesting to look at how the population of the Parkes Shire has changed over the years. 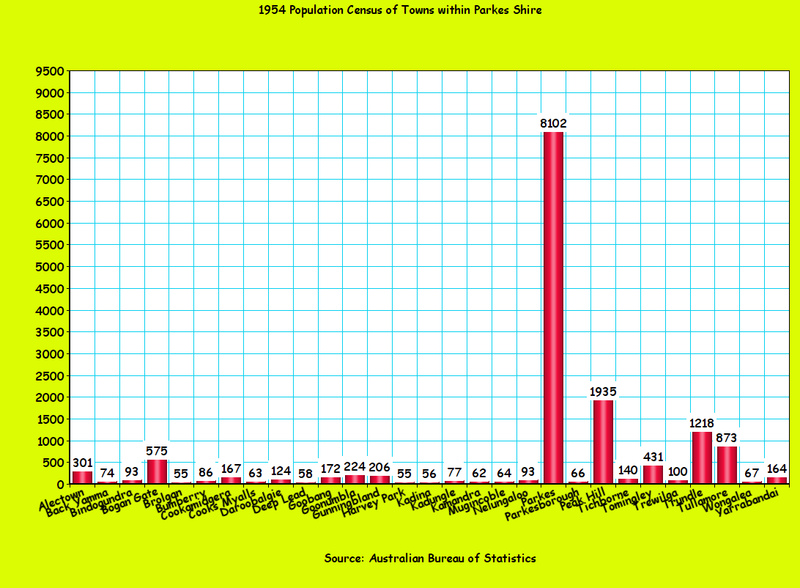 This is the second part on changing population figures of the area known today as the Parkes Shire (click here for The Rise, Fall and Rise of the Population of the Parkes Shire Part 1 1865 – 1953) The modern day Census – once every five years on the second Tuesday of August, was not far from being implemented by the Commonwealth Bureau of Census and Statistics (CBCS). The first national census after the Second World War was conducted in 1947. It had been 12 years since the last national census, and Australia had undergone significant changes. The Great Depression, the Second World War and the commencement of the generation known as ‘the Baby Boomers’ had all had an impact on the people of the Parkes Shire. There were interesting impacts on the population in the Parkes Shire between the 1947 and 1954 censuses. 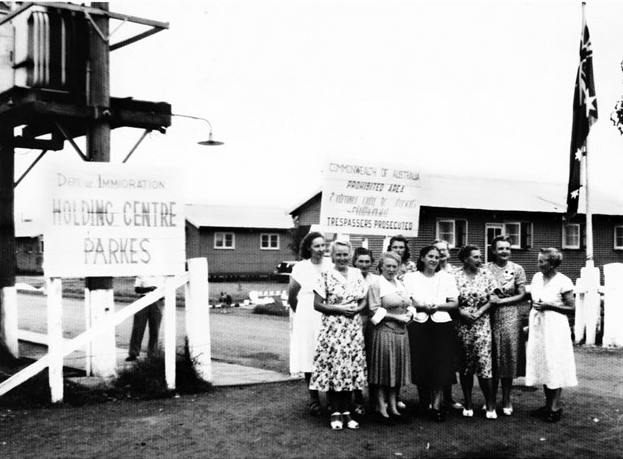 The population rose, albeit temporarily, with the opening of the Parkes Migrant Centre at the site of the Parkes airport. This added up to 2,000 to the population at one time. 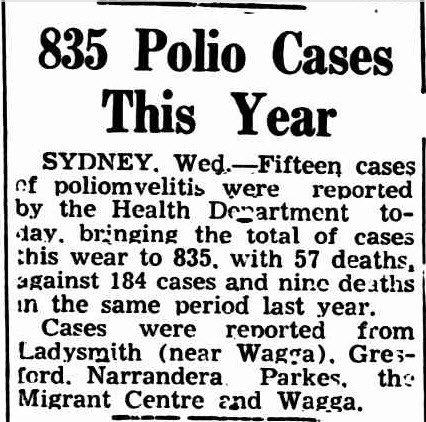 In 1950 there was an increase in the amount of people affected by polio – including cases discovered at the migrant centre. 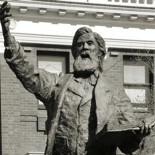 Had a census been scheduled for 1950, hundreds of Forbes residents would have added to the Parkes figures. 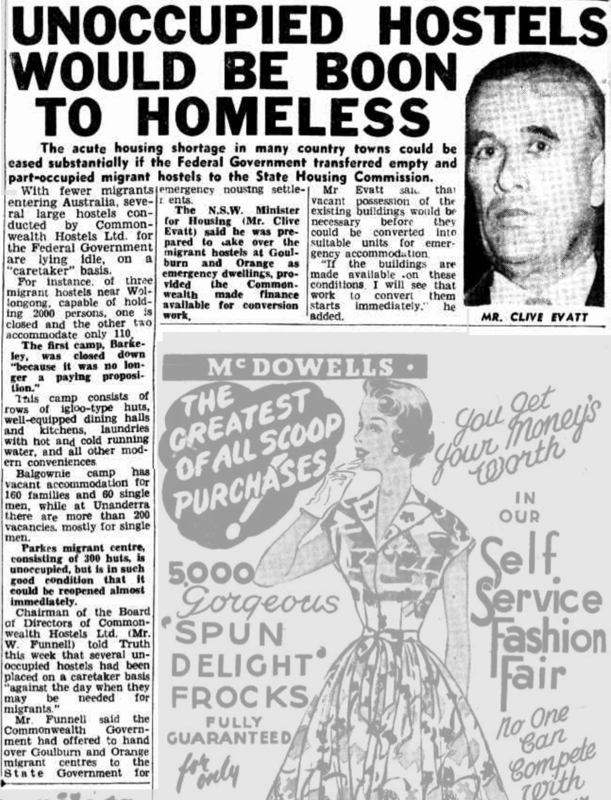 This was because severe flooding in Forbes resulted in temporary resettlement at the Parkes Migrant Centre. 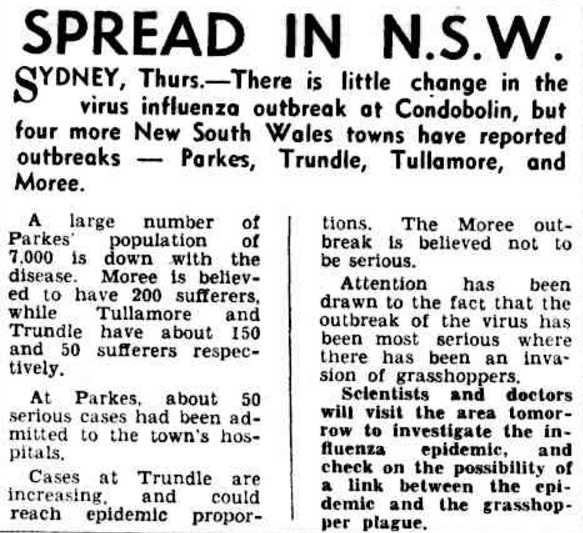 By 1953 the migrant centre was closed and an influenza epidemic was affecting the Central West. Before the next census, the Parkes migrant camp would be empty. Its availability, along with other vacant migrant holding facilities, was a potential solution to a problem that occurs with an increase in population – homelessness. To conduct the Census, the Commonwealth Bureau of Census and Statistics divided the country into the states and territories. New South Wales was then divided into Statistical Divisions. Each Statistical Division was divided into Local Government Areas (LGAs). These were Shires except where noted as Municipalities or Census Sub-divisions. The area today known as the Parkes Shire fell into the Central Western Slope Statistical Division, with most of the region falling in the Goobang LGA, while some areas were in Jemalong, Boree, Lachlan and Timbrebongie. 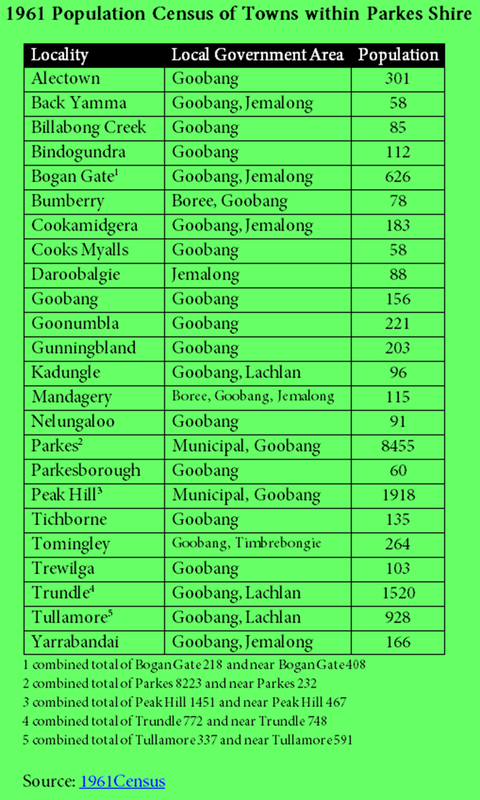 Parkes and Peak Hill also had some numbers counted as the municipality and some listed as Goobang Shire. 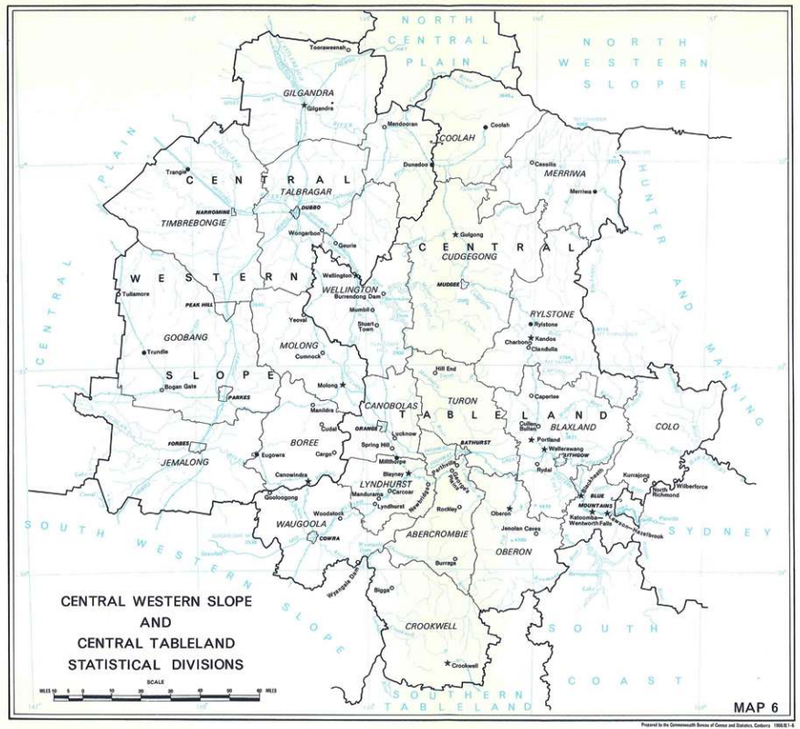 Notable changes since the 1947 Census is the disappearance of Blow Clear, Bruie Plains, Coradgery, Dunmore, Front Daroobalgie, Mandagery, Milpose, Mingerong, Mungery, Numalla, and Tomingley West. New localities included Brolgan, Cooks Myalls, Harvey Park, Kadina, Kamandra, Mugincoble, and Wongalea. In 1961 the Commonwealth Bureau of Census and Statistics found the following results from its census. The census was conducted on 30th June 1961 and contained similar detail to 1954’s census. Notable differences were the disappearance of Brolgan, Deep Lead, Harvey Park, Kadina, Kamandra, Mugincoble and Wongalea. There was a new inclusion of the locality at Billabong Creek. An interesting return was that of Mandagery, which featured in the 1947 Census but not the 1954 Census and was now back listed in the 1961 Census! In 1966 the Acting Commonwealth Statistician was J.P. O’Neill and the CBCS had devised a new way to record results. The published results related to locations which at the time of the Census had a minimum of twenty dwellings (occupied and unoccupied) and one hundred persons (in previous Censuses this was fifty persons). With the changes in population within the area, there are not as many places within the Parkes Shire listed. Under these guidelines only five places featured in the published data: Parkes, Peak Hill, Trundle, Tullamore and Bogan Gate. 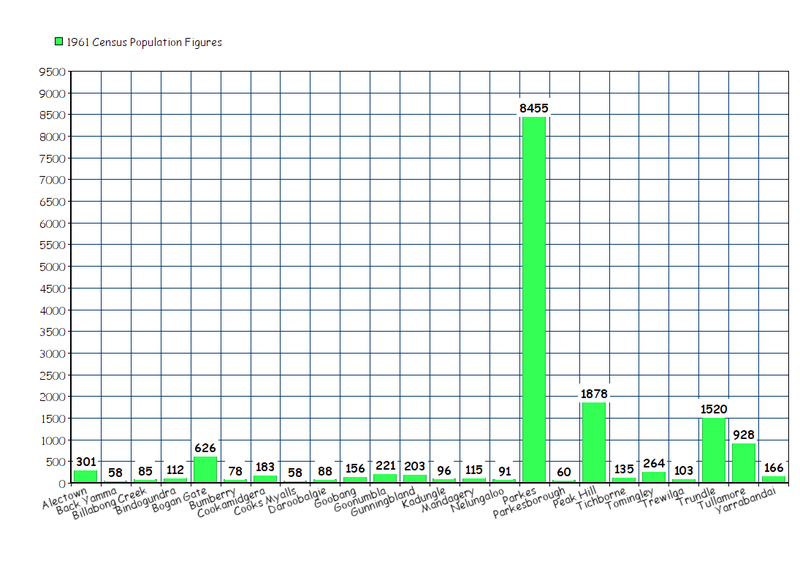 The figures do not include the combined total of Municipality/town and “near”. The table below only lists those within the township not the surrounding areas. Since the first Census – conducted by the colonies prior to Federation – Aboriginal and Torres Strait Islanders were not counted. By the late 1960s plans were in place to change this erroneous practice. 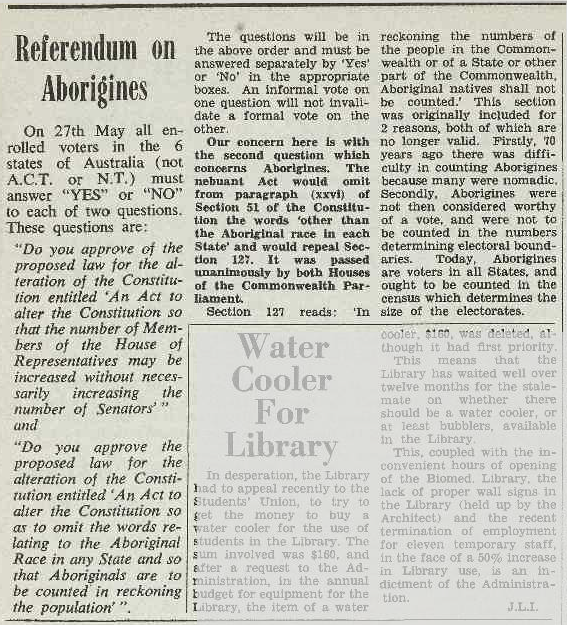 Newspapers were instrumental in the change to recognise the first Australians. The Parkes Shire is within Wiradjuri nation, yet up until 1967 no Wiradjuri man, woman or child were counted in the figures for localities in the Census. By 1971 the criteria for being recorded in the census was still urban centres and bounded localities with 200 or more persons. Due to changes within the community, Bogan Gate no longer qualified for its own recording. Only Parkes, Peak Hill, Trundle and Tullamore met the criteria. 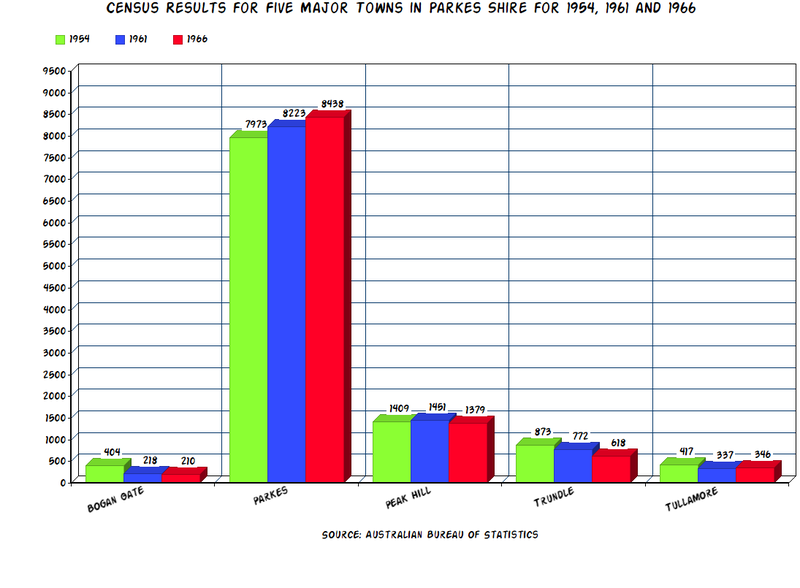 Parkes and Peak Hill were both recorded as Urban Centres while Trundle and Tullamore were classified as Rural. 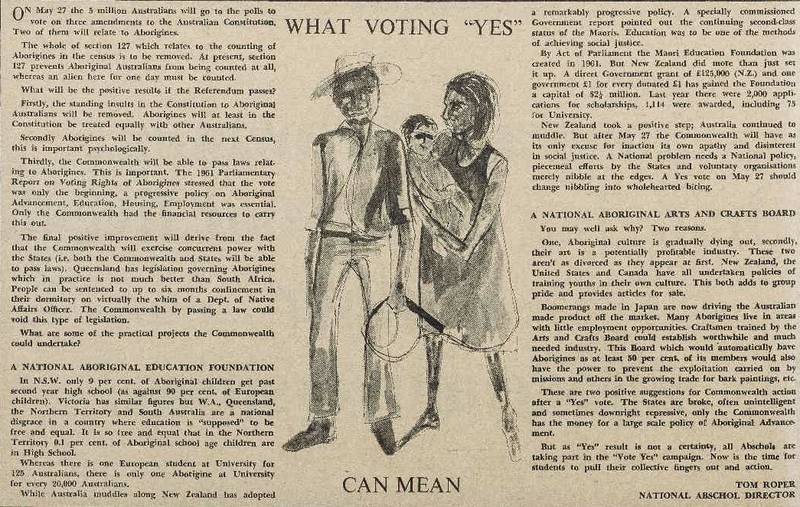 Due to the results of the 1967 referendum, Aboriginal and Torres Strait Islanders were counted in the 1971 Census for the first time. 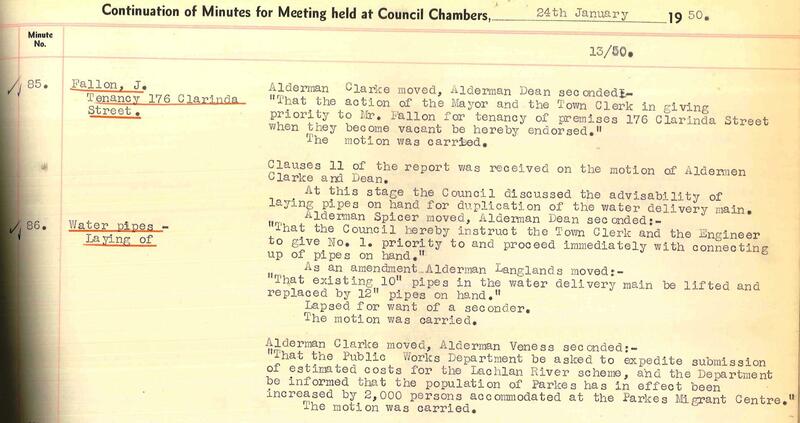 Council Meeting Minutes January 24th 1950(Rep. No. 86). (n.d.). Holding Centre at Parkes 1950 [Photograph]. (n.d.). New Life In Australia, http://anita850.tripod.com/, Parkes. 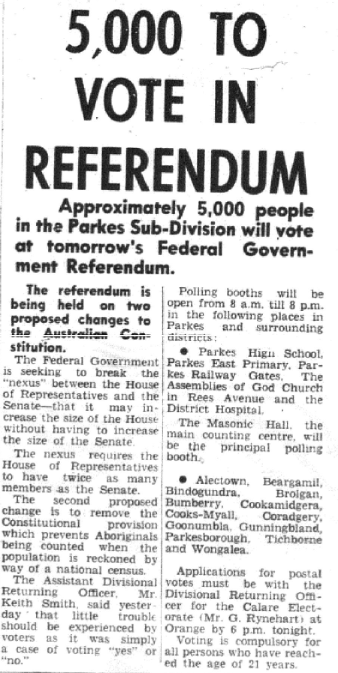 5,000 To Vote In Referendum [Microfilm]. (1967, May 26). Parkes Champion Post, p. 1. This entry was posted on November 28, 2016 by parkeslibrary in 1940s, 1947 Census, 1950s, 1954 Census, 1960s, 1961 Census, 1966 Census, 1970s, 1971 Census, Uncategorized and tagged 1947 Census, 1954 Census, 1961 Census, 1966 Census, 1967 referendum, 1971 Census, Aboriginal referendum, Aboriginal rights, ABS, Acting Commonwealth Statistician, Acting Commonwealth Statistician J P O'Neill, Alectown, Anita Apinis-Herman, Anna Apinis, ATSI, Australia, Australian Bureau of Statistics, Australian census, Back Yamma, Billabong Creek, Bindogundra, Blow Clear, Bogan Gate, Boree, Boree LGA, Brolgan, Bruie Plains, Bumberry, CBCS, census, Central Western Slope, Central Western Slope Statistical Division, colonies of Australia, Commonwealth Bureau of Census and Statistics, community, Cook's Myalls, Cookamidgera, Coradgery, Daroobalgie, Deep Lead, Dunmore, dwindling population, family, Federal Government Referendum, Federation, Forbes Advocate, Forbes apathy, Forbes bean crop, Forbes beans, Forbes flood ghost town, Front Daroobalgie, ghost town, Goobang, Goobang LGA, Goobang Shire, Goonumbla, Gunningbland, Harvey Park, history, Hobart Mercury, holding centre Parkes, homeless in Parkes, homelessness in Parkes, indigenous affairs, indigenous Australians, indigenous rights, J P O'Neill, Jemalong, Jemalong LGA, June 30 1947, June 30th 1947, Kadina, Kadungle, Kamandra, Lachlan, Lachlan LGA, LGAs, M and D review, Mandagery, migrant centre, migrant hostel, migrant women save beans, Milpose, Mingerong, Morning Bulletin, Mugincoble, Mungery, Nelungaloo, Numalla, Online Chart Tool, Parkes, Parkes airport, Parkes Champion Post, Parkes Migrant Centre, Parkes Migrant Hostel, Parkes Municipal Council, Parkes Municipal Council minutes, Parkes Municipality, Parkes Regional Airport, Parkes Shire, Parkes Sub-Division, Parkesborough, Peak Hill, Peak Hill Municipality, polio, polio outbreak, popular culture, population, population fluctuations, pre-Federation, Referendum on Aborigines, Rise Fall and Rise, Rise Fall and Rise of Population of Parkes Shire, Rockhampton Morning Bulletin, rural, rural centres, Second World War, Statistical Division, Sydney Truth, Tharunka, Tichborne, Timbrebongie, Timbrebongie LGA, Tomingley, Tomingley West, Trewilga, Trundle, Tullamore, unoccupied hostels, urban centres, Welcome to Wiradjuri Country, Wiradjuri, Wiradjuri Country, Wongalea, Yarrabandai.